A new den for the John Ball Park bear, completed in November of 1895, was celebrated by citizens who had been invited to the park by the bear and the city aldermen to view the bear in his cozy new home. In April of 1895, the John Ball Park bear came out of his winter sleep in good condition, but his appetite for beer and soda pop was a trifle sharper than when he went into his den ten weeks earlier. Aldermen on the parks committee were saddened because they lacked the funds to build a cave with an elegant grated front for bruin’s summer residence. The bear probably would have been happy in his present quarters for a while, as long as he received regular calls from the beer wagon during the long hot summer. In June the parks committee made an announcement guaranteed to bring joy to the lonesome heart of the bear. A liberal minded citizen agreed to present Mr. Bruin with a handsome cinnamon colored bride if the aldermen would appropriate the $800 needed to build a comfortable den in which the couple could begin housekeeping. There was little doubt that an appropriation for a bear den would appear in the annual budget. The new den was completed in November, and Alderman Teachout was sure the bear would be happy all through the cold, hard winter. 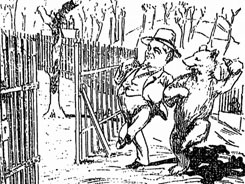 The alderman and the bear sent out invitations to citizens, and members of the common council to assemble in the park and view the bear in his cozy new home. The bear embraced his last opportunity to absorb soda pop in large quantities before lapsing into his winter snooze.